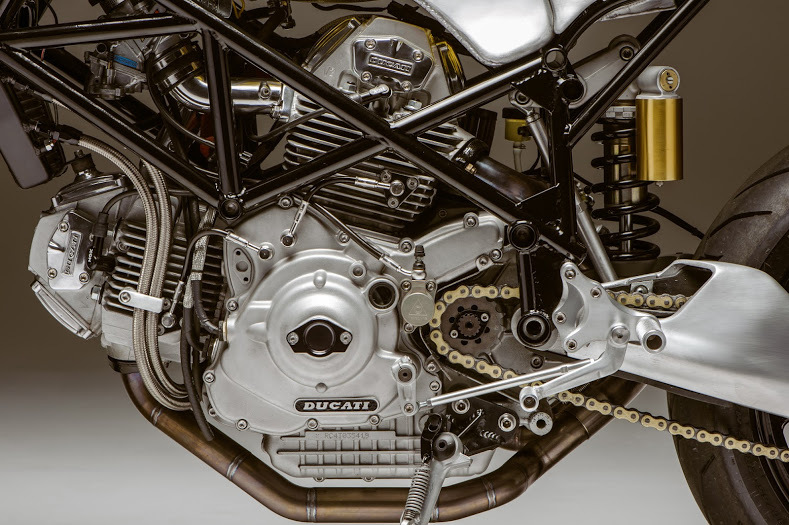 Clay Rathburn of Atom Bomb Custom Motorcycles transformed 1996 Ducati 900SS into a serious streetfighter. “I guess this project was about building the right home for a fantastic engine, and (as usual) doing something I’ve never done before by building a proper sport bike,” says Clay. Now known as “Eleven,” this bike features a 999 frame built from scratch, newly fabricated aluminum bodywork, and much more. Since the 900SS was a personal project, the budget was limited- forcing Clay to mix and match suspension components. So there’s Showa forks from a late-model Suzuki GSX-R, Brembo monobloc radial brake calipers (also from a GSX-R) matched to floating Brembo rotors, a set of Keihin FCR carbs, a new tank that holds 4.5 gallons of gas, a powder coated Ducati performance fender, and an Aprilia RSV front wheel, with a Ducati 999 rear wheel, swingarm and shock out back.